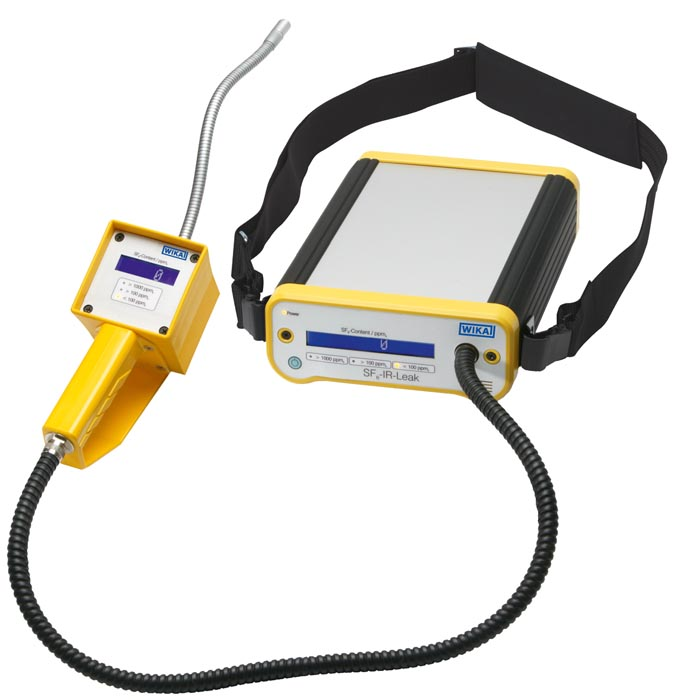 The gas detector model GIR10 is used for the detection of the smallest SF6 gas concentrations and is thus ideal for detecting the place and size of leakages. The GIR10, which is based on the non-dispersive infrared technology (NDIR), offers fast response times and reliable measured values even in case of small leakages. This instrument is characterised by simple handling and good readability. Both the hand-held instrument and the console case are equipped with a digital indicator which is easy to read. This allows reading the current SF6 gas values from any position. The leakage detection is carried out using a hand-held instrument which has a movable gooseneck with gas inlet on the front side. An exchangeable filter prevents particles from being sucked in, thus protecting the infrared sensor. A pump in the console case provides continuous flow of the sucked-in gas mixture through the sample chamber of the infrared sensor. If the SF6 gas is already present in low concentrations in the measurement environment, this offset can be tared to 0 ppmv at the instrument. It makes the leakage detection easier, as every measured value greater than 0 ppmv represents leakage. Depending on the version, model GIR10 sends an acoustic alarm when defined concentrations are exceeded.